Note: This is a post I originally wrote for the 1947project in 2005. I’m reposting it for newer readers. CAIRO, Nov. 30. (AP) With Arab bitterness mounting in the Middle East, Syrian demonstrators set fire to the United States Legation in Damascus today. The Arab League’s secretary general declared his people will never permit the United Nations to partition Palestine. A reliable source here said King Ibn Saud of Saudi Arabia has agreed to contribute the oil revenues of his kingdom—paid to him by American oil companies and estimated at $18 million a year—to support Arab military forces to fight partition. There was no indication the Arabs planned immediate military action, but six Jews were killed and 16 wounded in Palestine outbursts today. 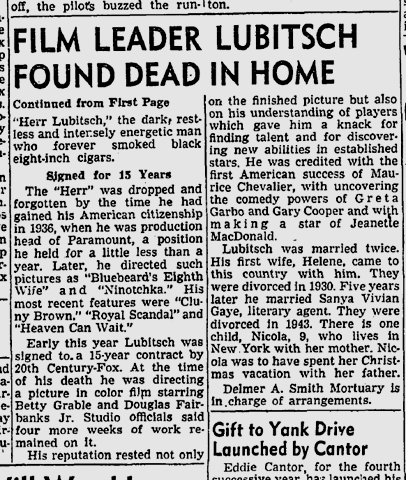 Bonus factoid: Ernst Lubitsch dies at his home in Bel-Air. He is 55. This entry was posted in 1947, Film, Hollywood, Obituaries and tagged 1947, Ernst Lubitsch, film, Middle East, obituaries. Bookmark the permalink.